San Francisco: The Nissan Murano's bulbous shape gives it the practicality of an SUV with the feel of a sports sedan. It's a luxurious and refined SUV that doesn't even hint at having off-road ambitions. Inside the Murano has comfortable front and back seats with high-quality materials. Standard features like a 10-way power adjustable driver's seat and dual-zone climate control give it a surprisingly luxurious atmosphere. Thanks to America's anti-minivan backlash, even the tiniest, wimpiest SUVs are advertised as rugged and adventuresome today. They're shown on TV covered in mud, perched on rocky trails, and packed with camping equipment. Well, at least one mid-size SUV doesn't pretend to be a mountain climber. At a time when the harshest conditions most SUVs face are potholes and thunderstorms in the city, it's refreshing to see Nissan call the Murano an "urban SUV." Indeed, the Murano is designed simply for driving around town in comfort and style, not looking like a gussied-up piece of surplus military equipment that could move Mount Rushmore. On the contrary, it's a sleek and sophisticated vehicle with a quiet cabin, smooth ride, refined engine, and cornering capability almost as good as that in a sports sedan. It's as if Nissan started with a world-class sedan, stretched the body, and lifted it a couple of inches off the ground. Really. With a powerful 3.5-liter V6 engine - the same one used in Nissan's terrific 350Z sports car and Infiniti's impressive G35 - the Murano is a very capable performer. It routes 245 horsepower through a continuously variable transmission (CVT) that never shifts like a traditional automatic transmission. Instead, it constantly adjusts to provide the perfect combination of power delivery and fuel economy - up to 25 miles per gallon on the highway and 20 mpg in town. 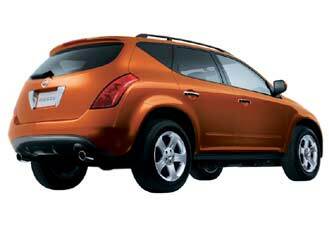 Despite its stellar engine and transmission combo, the Murano's best asset is its suspension. It provides one of the smoothest, quietest rides in any SUV, yet it feels surprisingly controllable and light in corners. Unlike the solid-axle designs some SUVs use to travel on rugged trails, Nissan picked a fully independent suspension that favors passenger comfort over Jeep-like climbing ability. It was a good move. Of course, the Murano doesn't just have to perform like an "urban SUV." It also has to look like one both inside and out. To start with, its overall shape and curvy styling is like nothing else on the road. It has a sloping front end that's almost reminiscent of European sports cars, along with an aggressive roof profile and a back end that's just plain funky. It's a very innovative and eye catching look. Inside, it has loads of storage space and roomy seating - the kind that made SUVs so appealing for families in the first place. There are cup holders and cubbyholes sprinkled throughout the cabin, including a lockable center storage bin that's big enough to hold a laptop computer. Nissan designed the Murano's cabin to provide "first-class seating" for two couples, but a total of five people can fit - if three of them don't mind being squished into the back seat. In this respect, it's more like a sedan than an SUV, which isn't a good thing for back-seat space. Interior quality is second to none, with tight fitting trim pieces and fancy-looking materials. It provides a sense of refinement that feels exactly like a mid-size luxury car, something hard to find in its price range. Speaking of price, the Murano is either awfully expensive or remarkably cheap - depending on how you look at it. If you compare the Murano's $29,150 base price to a Ford Escape or Honda CRV - both of which are, like the Murano, popular car-based SUVs with smooth rides - it looks about $8,000 too expensive. Ouch. But a more accurate picture comes from comparing the Murano to slightly larger and more luxurious SUVs like the Acura MDX or Lexus RX-330. While the base Murano comes with a long list of high-end features at no cost, like a 10-way power adjustable driver's seat and dual-zone climate control, it's at least $8,000 cheaper than the SUVs with the fancy badges. Then its pricing is very nice. In any event, the Murano impresses for its ability to mask sports sedan performance with the utilitarian features of an SUV. It proves that SUVs don't have to be macho - and probably shouldn't be.